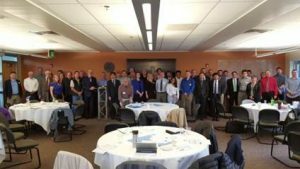 Two graduate students of the Phoenix Leader Education Program participated in the Central Rocky Mountain Chapter of the Health Physics Society’s Annual Spring Technical Meeting which was held at Colorado State University in Denver, U.S.A. on Thursday, April 20th, 2017. This chapter meeting of the Health Physics Society and Colorado State University is both a highly evaluated and well-respected event in this field. Hiroshima University students have presented at this meeting for two consecutive years. There were 23 participants (graduate students) in total, including the 2 graduate students from the Phoenix program. Each of them gave an oral presentation explaining their specific research and actively joined in the discussion and Q&A session. It was a dynamic event with the hall filled with energy and enthusiasm. A wide range of topics were selected for presentations such as radioactive contamination due to the Fukushima Daiichi Nuclear Power Plant accident and the separation of radioactive material by chromatography among others. 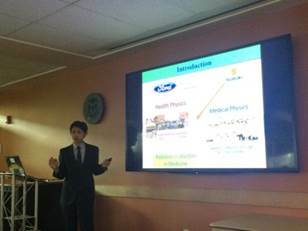 The two Phoenix Program student presentations were as follows: Mr. Moriyama explained the physical activity level of senior evacuees who have been living in temporary housing units since the Fukushima Daiichi Nuclear Power Plant accident. He was asked about the real-life conditions of the evacuation, and specifically the effects on evacuees such as the change in levels of physical activity during the last six years. 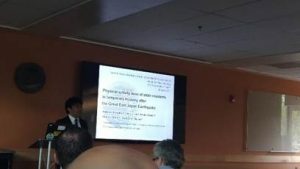 Mr. Suzuki discussed the topic of efficiency of the TLD film in the radiation treatment field. He was questioned specifically about film fading, and subsequently engaged in a meaningful exchange of opinions with students who study related fields about medical exposure and the evaluation of skin dose in radiotherapy. 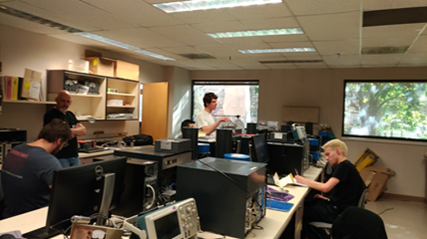 They also had valuable experiences of attending a lecture about radiation measurement given by the Health Physics Program and visiting the health physics graduate student laboratory at Colorado State University.